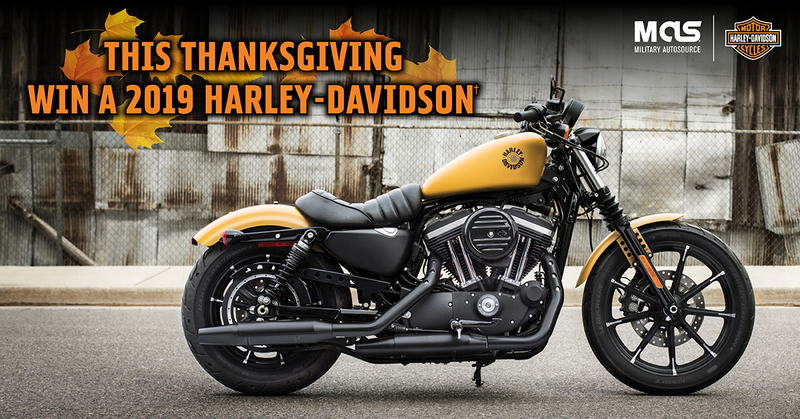 This Thanksgiving Win A 2019 Harley-Davidson! Enter now through November 20th for your chance to win a 2019 Harley-Davidson Iron 883. Military AutoSource proudly salutes our Military by giving a 2019 Harley-Davidson Iron 883 to one lucky winner in the Middle East. If you are stationed overseas in the Middle East click here to enter for your chance to win a brand New 2019 Harley-Davidson Iron 883 this Thanksgiving! There will be a live drawing on Thanksgiving Thursday November 22nd. †No purchase necessary to enter. One grand prize winner will receive a 2019 Iron 883 Harley-Davidson. See above link for complete rules and regulations or speak to your local Sales Representative. All programs and guarantees are subject to terms and conditions. All illustrations and specifications are to the best of our knowledge correct as of the date of publication. They are subject to changes made by the manufacturer and the laws or regulations of any federal, state or local government agency. Overseas Military Sales Corporation is an authorized contractor of the Exchange and NEXCOM. Military AutoSource is an authorized distributor to sell and distribute Harley-Davidson® motorcycles. This advertisement does not express or imply endorsement by the Exchange, NEXCOM, DOD components, or the Federal Government and is not sponsored by them. There doesn’t appear to be a link on this page anywhere for entry. Sorry about delay in getting back to you and for the missing link. You can register here: https://militarycarprogram.militaryautosource.com/Harley-Davidson_BikeGiveaway.html and this post has also been fixed. Thanks for letting us know! i could not click to register to win.